Hello! This is Karla from the DCWV Social Media Design Team. Today, I want to show you this layout full of messy goodness. 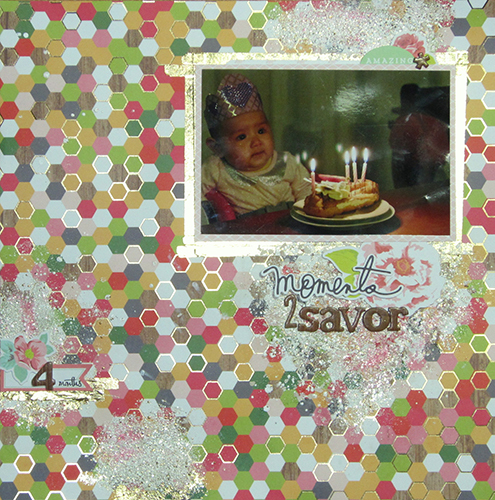 I started with the hexagon paper from the Hello Darlin' stack, which you can find at Joann stores. Then I put down some lines of Imagine Crafts Tear It tape in the shape of a rectangle, a little bigger than 4x6. I peeled the adhesive and used gold foil sheets to make a gold photo mat right on my background paper. I also added more tape lines and gold foil to a couple other places on the page. Next, I brought out my favorite shabby embossing powders and paint fragments. I mixed the paint fragments and embossing powders and spread them out in a few places on the page. I heated the powders from the bottom to melt everything together. This is my baby at 4 months. She got a pastry to celebrate every month around her birth date and we ate it for her :) I love the way the candle flames look like hearts in this photo. I might go back and add some gold hearts on the layout. By the way, that crown she's wearing is mom-made. I made it using the Violet Leaf stack and Adhesive Gem sheets. Have you used the Hello Darlin' stack lately? Show me in the comments, I'd love to see!